We provide new computer system units using the latest technology and include the full manufacturer warranty. We assemble our computers in our office using components we individually select from the best manufacturers. We provide new system units either with Windows software installed or your existing Windows software, license and sticker can be transferred. We design our desktop computers to be simple to service, easy to upgrade and reliable to own. We avoid using overly complex, hard to repair parts and focus on selecting reliable, high quality parts instead. Our desktop computers use all standard parts instead of proprietary or unique parts. Using industry standard parts makes the computer less expensive to repair and upgrade. Even though the power supply on this computer is rated at up to 350-watts, the typical power usage of this computer is 1 watt in standby/power-off mode, 50-watts idle and around 75-watts active. We assemble and test our computers from parts we select. This allows us to choose components with better features and longer warranties that pre-built systems offer. We maintain a fixed price and continually upgrade the components we offer to reflect the market availability of new technology. Intel Pentium G3220 dual core 64-bit socket 1155 CPU at 3ghz with 3mb L3 cache. Upgrade options for faster CPU’s are available, including i3, i5 and i7. 4gb DDR3-16000 RAM. Upgrade options for 8gb or more of RAM are available. 22x black SATA DVD-RW with LightScribe feature. Choice of 60gb SSD (solid state) or Seagate 500gb SATA3 (600mbps) hard disk drive with 8mb cache and 7200-rpm motor spindle. Upgrade options for larger hard drives and larger SSD drives are available. 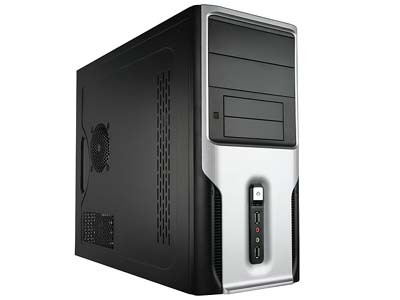 TX-388 micro ATX black mid-tower case, pictured above. Asus H81M-C motherboard with Intel socket 1155 and Intel Haswell chipset and all solid capacitors. Integrated sound, DVI, VGA, gigabit Ethernet, two SATA-300, two SATA-600, four USB 2.0 and two USB 3.0 ports. Note; no IDE or diskette connectors are included. Microsoft Windows and Microsoft Office software and license not included and sold separately. Keyboard, mouse and monitor are not included and sold separately. All parts include a manufacturer replacement warranty. Return to previous hardware page.